This is a guaranteed real Sperm Whale tooth that is registered with the Department of Commerce as number 21-0231-0012. It weighs 154.8 grams. This is a well-shaped horizontal Sperm Whale's tooth which measures 5 inches around its curve, and 1 3/4 inch wide at its base. On the front is a carefully executed portrait (with some light color) of the Downeaster "Hotspur" raising its skysails at the start of an outward bound trip. The back is etched with the name "Hotspur"
The "Downeasters" were a type of square rigged freighters built in Maine after the Civil War. They were made to be cheap to build and operate, and freighted every type of bulk goods from ice, cotton, fruit, factory goods and coal, as well as lumber from the west coast. They roamed all the world's oceans. The era of their dominance lasted only until the mid-1890's. "Hotspur" was built in Bath, Maine in 1885. She was almost 192 feet in length and 1273 tons. She was owned by the W. H. Besse Company. This 'skysail-yarder' had a very short life - She stranded on a reef in 1887 and was lost. 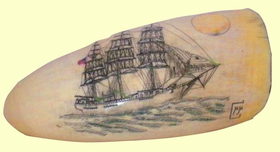 This collector's scrimshaw tooth is sold without a stand. A hand-turned circular Cherry wood or handmade sterling silver stand to fit is available as an additional option. This Sperm Whale's tooth signed by M.M. Cohen is polished on both sides. A classical tooth that would make a great gift!